A tool free solution, 1/2 inch adjustable tension rod with spring tension mounting system are offered in three sizes and accommodates inside mount windows for 15 inches to 54 inches wide. Select from four plated finishes: White, Antique Brass, Black, and Brushed Nickel. 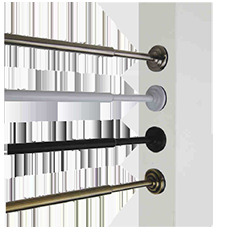 The Amelia Cafe Curtain Rod is 7/16 inch diameter and is offered in lengths of 28 to 48 inch and 48 to 84 inch. Bracket clearance is 3/4 inch. All hardware is included. Black. 7/16 inch diameter Cafe Rod in your choice of White with brass finials, all brass, or oil rubbed bronze. 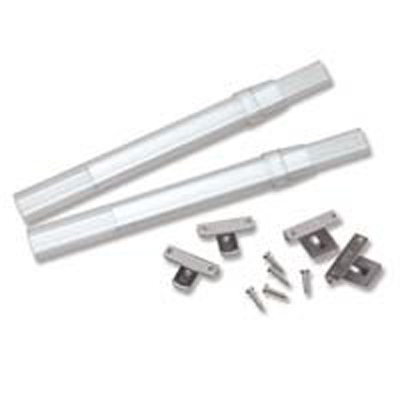 Set includes two brackets with a projection of 1 1/4 inches, and 3/4 inch clearance. Includes four screws to secure rod in place. This cafe rod will fit any curtain with a 1-1/2 inch rod pocket. Lengths include 16 - 28, and 28 - 48". Satin Silver Cafe Rod is offered in lengths of 28 to 48 inches and 48 to 84 inches. Bracket clearance is 3/4 inch. All hardware is included. 11/16" diameter Flat Sash rod pairs are great for controlling door panels with rod pockets on both top and bottom. With only 1/4" clearance, the sash rod mounts very closely to the window panel. It's made of durable steel with white enamel finish that the Kirsch brand is known for. The Flat Sash rod is easy to install and creates a professional-looking finished product, and is generally used with door panel curtains with a 1 ½" rod pocket on top and bottom. The Sash rod pair is offered in three sizes, including 8 to 12", 12 to 18", and 18 to 28", fitting sidelight window panels and windows from 8" to 28" wide. Package contains two rods and appropriate brackets and screws for easy installation. Sash rod pairs from Kirsch let you do the job once and forget about it. The steel and white enamel pairing means these rods are as tough and steady as they are appealing to look at. Make your curtains look professionally hung with the gleaming silver and white enamel flat sash rod pairs from The Curtain Shop. With three sizes to choose from you can make sure your project is perfect and your curtain panels secure. Open one package and find everything you need to hang window curtains. 11/16 inch diameter Kirsch Flat Sash Rod is designed to be mounted on windows and doors when a close fit is desired. The finished product is mounted very close to the window with a 1/4 inch clearance. It is easy to install and creates a professional-looking finished product. It fits curtains with a 1 1/2 inch rod pocket. 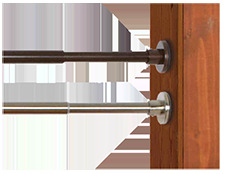 The 11/16" Kirsch Flat Sash Curtain Rod comes with installation brackets and screws. Select from three sizes: 16 to 28 inch, 28 to 48 inch and 48 to 84 inch. 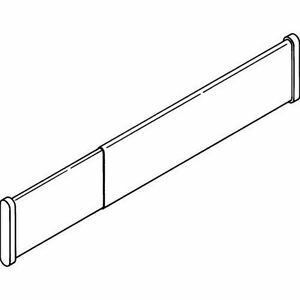 A center support bracket is included with the 48 to 84 inch length. The Kirsch Spring Pressure Rod Pair is for use inside a window frame. They need no brackets, and are generally used for gathered curtains. They are made of steel with durable white enamel finish with covered ends are made of rubber to prevent scratching of your window frame. Adjusts to fit windows between 8" and 16" wide. Select from two sizes: 8 to 11 inch, or 11 to 16 inch. 5/8" diameter Kirsch Spring Pressure Rod is for use inside a window frame and needs no brackets. It is made of steel and durable white enamel finish, with rubber ends to prevent scratching your window frame. The Kirsch spring pressure rod is generally use for gathered curtains, and adjusts to fit windows between 16 and 72 inches wide. Kirsch 2 1/2" Continental rod comes in two telescoping sizes, 24" to 36", and 58" to 65" (shower curtain rod). Spring pressure lets you hang curtains inside window frame. No projection, no brackets needed. The Kirsch Continental Spring Tension Rod is perfect solution for apartments, dorms or any area where you need a simple window solution. No holes or mounting brackets. You can also use in bathrooms, bedrooms, closets and more. To install, unscrew the small rod section until it is about 1/2 inch wider than your casing opening. Compress rod, and place rod inside casing at desired height and release. CLEAR plastic sash rod pair adjusts from 20 inch to 36 inches. Brackets and screws are included with a 1/2 inch projection. The Graber Clear Plastic Sash Rod Set is perfect for hanging sheer or lace curtains. You can focus on your curtains, not on the hardware, with this clear plastic sash curtain rod. This straight rod is great for narrower windows or door curtain panels but can also be used for most any window between 20 inches and 36 inches wide. The clear plastic rods virtually disappear under sheer and lace curtains and are perfect for layering sheers with curtains or a valance. Rods are made of plastic with steel brackets and screws. Tip: If the clear plastic rods appear to be too shiny, apply a thin layer of toothpaste to the rod and allow to dry before carefully adding the curtains. CLEAR plastic sash rod pair adjusts from 7 inches to 11.5 inches. Brackets and screws are included with a 1/2 inch projection. The Graber Clear Plastic Sash Rod Set is perfect for hanging sheer or lace curtains. You can focus on your curtains, not on the hardware, with this clear plastic sash curtain rod. This straight rod is great for narrower windows or door curtain panels but can also be used for most any small window between 7 inches and 11 inches wide. The clear plastic rods virtually disappear under sheer and lace curtains and are perfect for layering sheers with curtains or a valance. Rods are made of plastic with steel brackets and screws. Tension rods and sash rods are excellent for a wide variety of window treatment applications, from hanging curtains on French doors to hanging gathered curtains with no hardware. We offer many adjustable tension curtain rods, sash rod sets, shower curtain rings, miniature tension rods and other fantastic options for hanging all your home's window treatments. Top name brands such as Kirsch and Graber provide high-quality sash and tension rod options for an enormous range of windows, window treatments and room configurations. Sash curtain rods are ideal for controlling door panels with rod pockets on both the top and bottom and are commonly used for French doors and casement windows. Spring tension curtain rods, often referred to as tension rods, are designed to hang your curtains and valances inside the window frame without hardware. Although they are typically less sturdy than other types of curtain rods, they're much more affordable and allow you to easily swap out drapes without hardware. Unsure which option to buy? Give us a call at 1-866-886-3632 and we'll be happy to help.